Tipi Negri, 1844. 8vo (cm. 19,5), 510 pp., 1 c.nn. (segue) Idem, Poesie varie... che servono di compimento al 12 fascicolo della Margherita Pusterla, Ibidem, LXIII pp. Legatura coeva in pieno vitellino marrone con ricche cornici e fregi oro ai piatti e al dorso. Titolo oro. Esemplare di dedica al Nobil Uomo il Signor Cavalier Gaetano Moroni 1Â° Aiutante di Camera di S. SantitÃ (scritta in oro sul piatto anteriore). Si uniscono: una lettera autografa dellâ€™Autore a Gaetano Moroni e un suo inedito componimento su due fogli intitolato â€˜Capitolo Bernescoâ€™ e indirizzato allo stesso Moroni. Edizione originale. Paris: Chez L'Auteur, 1844. First edition. 8vo., , errata, 127 pp.,  folded plate, 4 pp. priced catalogue. Modern cloth over boards with gilt titled leather spine label. A contemporary related article was glued to the reverse of the title page, leaving a moderate stain on the title page as well as the following leaf. There are a few faint spots of foxing, otherwise this is a bright and near fine copy. Charles Chevalier (1804-1859) was the leading French manufacturer of the camera obscura, lenses and optical instruments. In 1826, he furnished Niépce with a camera and lens of his own design for his early experiments in reproducing images through the agency of light. He told Niépce of the similar experiments of Daguerre, for whom he also made lenses and cameras, as well as advised him on his experiments. It is Chevalier who made the introduction which lead to the partnership between Niépce and Daguerre. Further, Chevalier supplied lenses and camera equipment for William Henry Fox Talbot. &#11;&#11;Charles Chevalier published his first manual in 1841; it was one of the earliest manuals of the daguerreian process. In this, his second manual, he has expanded upon the daguerreian process with the latest improvements, and now includes the paper processes of Herschel, Talbot, Hunt and Bayard. &#11;&#11;Roosens & Salu No. 2852. Bellier de la Chavignerie, Manuel Bibliographie du Photographe Francais, 1863. No. 22. 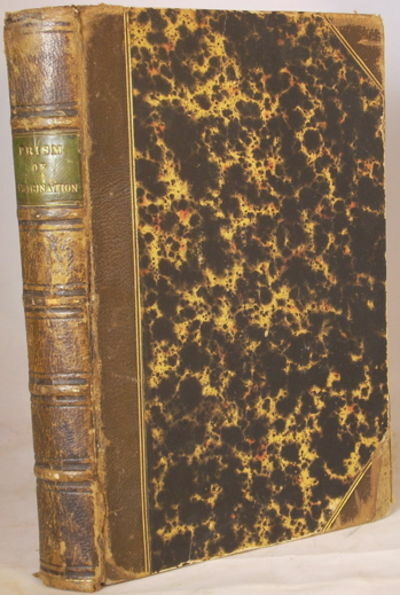 London: Albemarle Street: John Murray, 1844 VG, 1st ed, 1844, only 500 copies printed. In the original publishers brown embossed cloth, corners bumped. Re-laid spine, gilt titles. frontis, , (vi-viii), , , , 2-150 pp, (8) adverts, 5 pls (portraits), 13 illustrations within text, yellow endpapers, ink numbers at spine base, library stamp to fpd & verso of frontis, hinges strenghtened, new rear endpaper, small label to verso frontis. But a nice copy of an uncommon item. (Lowndes 1855). A portrait of a leading geologist whose work on the understanding of strata was an important contribution to the field. In 1831, the new generation of Fellows of the Geological Society, long aware of the treatment meted out to Smith, awarded him their first Wollaston medal in ?recognition of his being a great and original discoverer in English Geology? 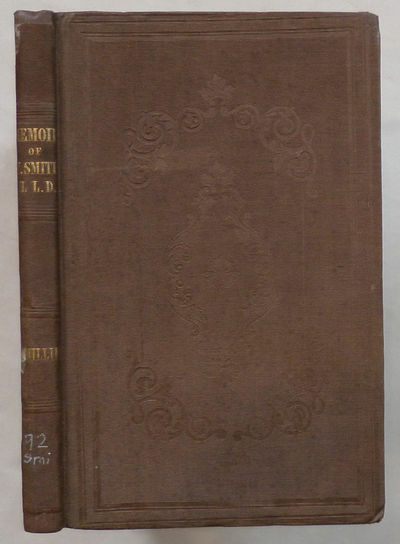 (Proceedings of the Geological Society, 1, 1831, 271). In 1832 he received a government pension of £100 a year. 1844. GARRUBA Michele. Serie critica de' Sacri Pastori Baresi. Bari, Tipografia Fratelli Cannone, 1844. In 4to; pp. 1008, 2n.nn. Sette tavole litografiche fuori testo con ritratti. Pergamena coeva, tassello al dorso con titolo e fregi in oro, cordoni. Lozzi, 284; Bottega Apulja, Meridionalia, 2334: "Raro a trovarsi completo delle tavole". Naples, 1844. unbound. very good(+). Map. Engraving with original hand outline. Image measures 20 3/8" x 13 1/8" Great map of San Marino in northeastern Italy and part of the Adriatic. Shows mountains, major routes and waterways. 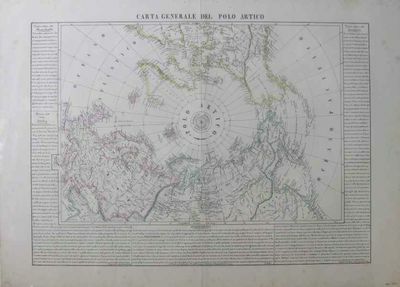 Benedetto Marzolla (1801-1858) was an Italian geographer. This map was published in his final atlas "Atlante Geographico". Other regions in this series are available in our gallery. Stamp to lower left. Minor toning to edges. Full original margins. Antica e nuova Grecia. Scene elleniche... con cenni ed illustrazioni sull'Antica Grecia del cav. professore Amedeo Peyron. Fontana, 1844. Due volumi di cm. 30, pp xii, 425 (3); (4) 488. Con moltissime incisioni nel testo, 10 tavole di ritratti e 38 tavole fuori testo di vedute incise un rame. Solida ed elegante legatura coeva in mezza pelle verde con punte, dorsi lisci con fregi e titoli in oro. Testo inquadrato da duplice filetto tipografico. Esemplare genuino ma con alcune sezioni di carte brunite. Longman, Brown, Green, and Longmans. Fair. 1844. B0042PDMZY Fair. 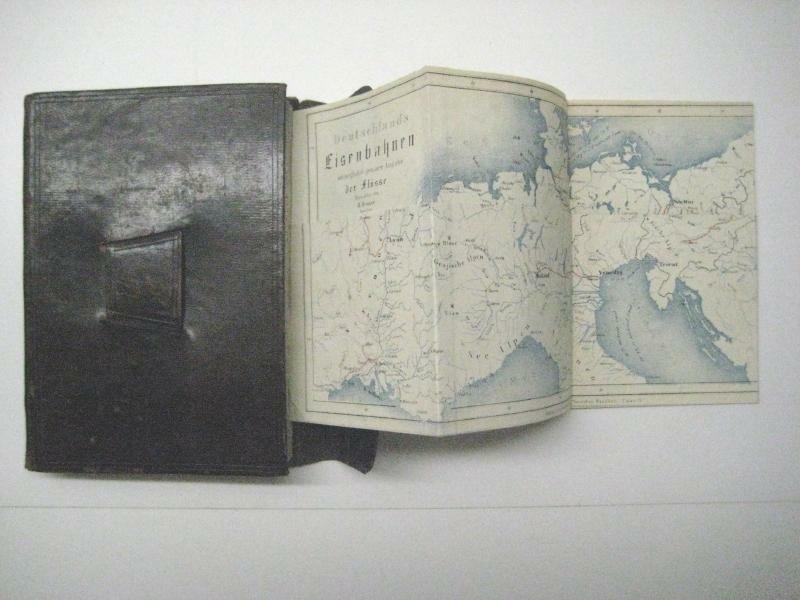 (Binding: Hardcover, Jacket: No Jacket) Half-leather, 21 cm, 69 ff. tp, chromolithographic page and illustration boarders, etc. designed by Owen Jones. Scarce. Fair copy but for light foxing throughout; leather spine deteriorating at edges. . B0042PDMZY . 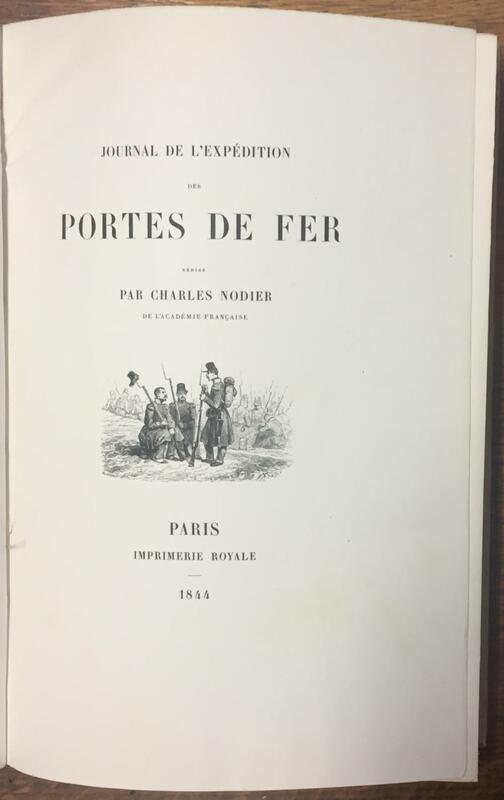 Journal de l'expédition des Portes de Fer. Latter-day Saints' Millennial Star, Volume V.
Historisch-geographische Darstellung des Kantons Appenzell, mit besonderer Berücksichtigung seiner Kuranstalten, Alpengegenden und Industrie. 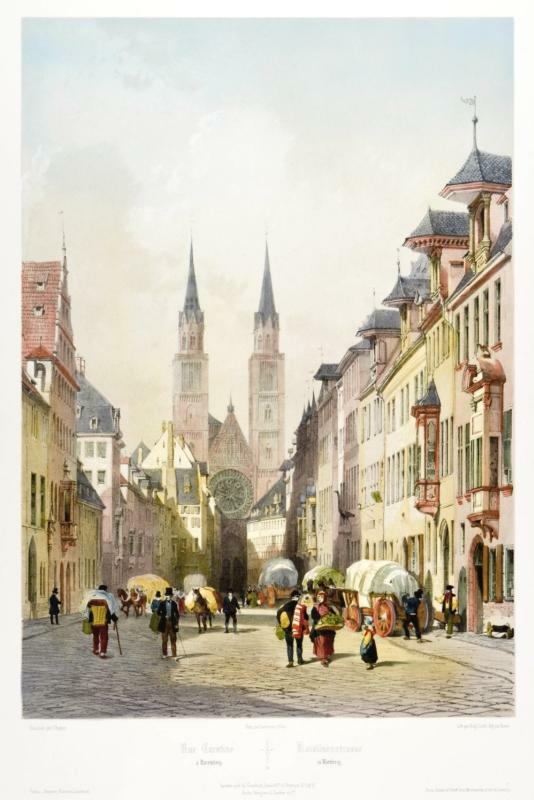 St.Gallen, Verlag von J. Tribelhorn 1844. - 8°. VIII, 296 S. mit 8 Aquatintaradierungen. Halbleinwandband der Zeit mit goldgeprägtem Rückentitel. Barth 19967. - Wäber 317. 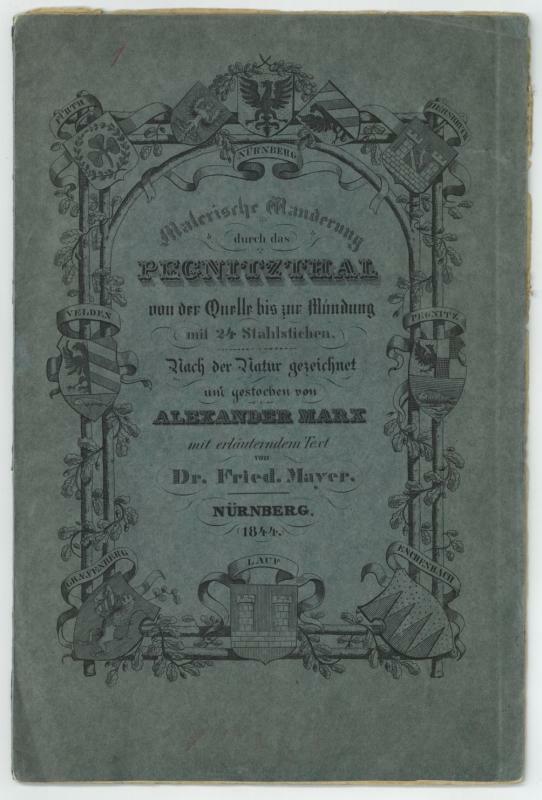 - Seltene Originalausgabe. Ausführliche Beschreibung der Bäder des Kantons. Der Arzt Gabriel Rüsch (1794 - 1856) gehört zu den wichtigsten Föderer der Industrie und des Badewesens im Kanton Appenzell. Verfasste mehrere ortskundliche Monografien. Die einst sehr gesuchten Ansichten zeigen: Seealpsee, Heinrichsbad, Weisbad, Bad Gonten, Gais, Appenzell, "Die Felsenhöhle mit dem Bruderhäuschen" und "Die Einsiedelei bei Ebenalp". - Rücken im Gelenk etwas angerissen. Papier durchgehen mässig bis stark stockfleckig, die Ansichten kaum betroffen. - Selten. Paris: J.J. Dubochet et Cie, 1844. First edition. 8vo., iv, 248 pp., illustrations in text. 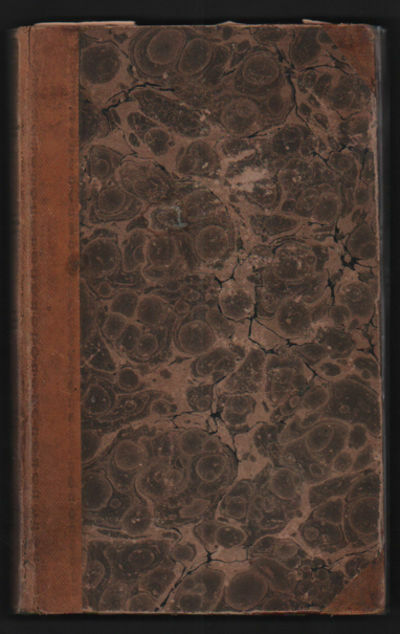 Contemporary binding of quarter calf with marbled paper over boards, gilt rules and titling on spine which reads, "TRAITÉ DE POTHOPRAPHE" (sic). Moderate rubbing to the board tips; a tiny droplet stain on the blank lower tip of approximately 20 pages, and else near fine. 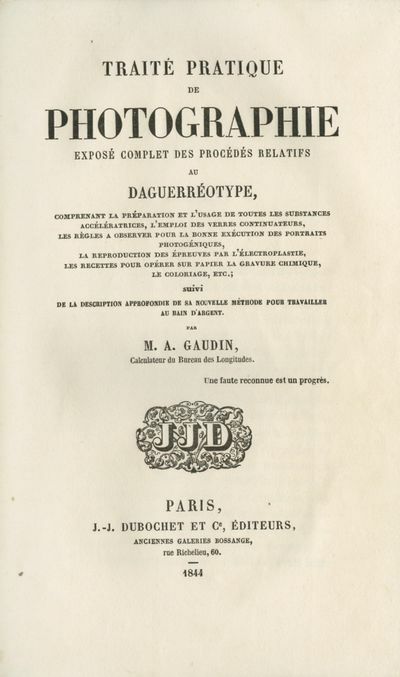 Gaudin's early and definitive manual covering every aspect of daguerreotyping including making, exposing and processing the plates, electroplating daguerreotype plates for making reproductions, making portraits; it also includes complete instructions for making Talbot's calotypes. Bellier de la Chavignerie, Manuel Bibliographie du Photographe Francais, 1863, No. 31. Roosens and Salu No. 2855. Paris: Chez L'Auteur, 1844. First edition. 8vo., , errata, 127 pp.,  folded plate, 4 pp. priced catalogue. Modern cloth over boards with gilt titled leather spine label. A contemporary related article was glued to the reverse of the title page, leaving a moderate stain on the title page as well as the following leaf. There are a few faint spots of foxing, otherwise this is a bright and near fine copy. Charles Chevalier (1804-1859) was the leading French manufacturer of the camera obscura, lenses and optical instruments. In 1826, he furnished Niépce with a camera and lens of his own design for his early experiments in reproducing images through the agency of light. He told Niépce of the similar experiments of Daguerre, for whom he also made lenses and cameras, as well as advised him on his experiments. It is Chevalier who made the introduction which lead to the partnership between Niépce and Daguerre. Further, Chevalier supplied lenses and camera equipment for William Henry Fox Talbot. 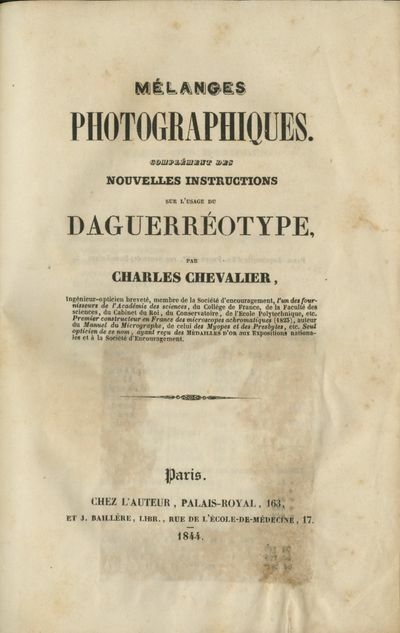 Charles Chevalier published his first manual in 1841; it was one of the earliest manuals of the daguerreian process. In this, his second manual, he has expanded upon the daguerreian process with the latest improvements, and now includes the paper processes of Herschel, Talbot, Hunt and Bayard. Roosens & Salu No. 2852. Bellier de la Chavignerie, Manuel Bibliographie du Photographe Francais, 1863. No. 22. Arithmetik und Algebra. Mit besonderer Rücksicht auf die Bedürfnisse des practischen Lebens und der technischen Wissenschaften. Nebst e. Anhange v. 450 Aufgaben. Collezione di reali rescritti, regolamenti, istruzioni, ministeriali e sovrane risoluzioni riguardanti massime di pubblica amministrazione in materia civile, penale, ecclesiastica, amministrativa e commerciale raccolti dal 1806 fino a tutto il 1840 e pubblicati . THE CELESTIAL EMPIRE; or, POINTS AND PICKINGS of INFORMATION ABOUT CHINA and the CHINESE. London, Grant and Griffith, 1844. 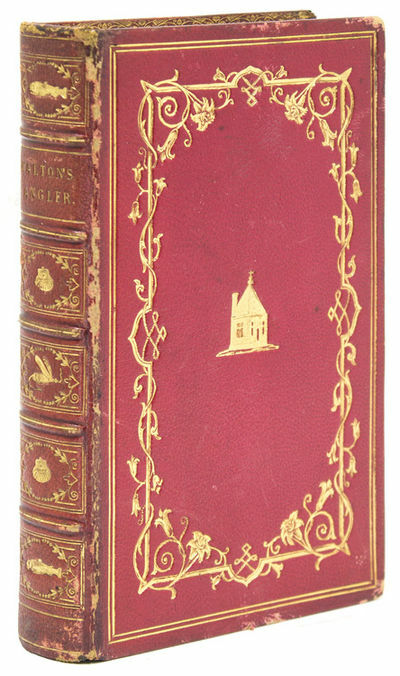 FIRST EDITION 1844, small 8vo, approximately 180 x 115 mm, 7 x 4½ inches, 20 illustrations by W. H. Prior, 8 full page engravings including frontispiece, and 12 text illustrations, pages: xii, 316 plus 16 pages of adverts, original publisher's cloth, gilt decoration to spine, blind decoration to covers. Head and tail of spine neatly strengthened, new endpapers, pale age-browning to margins of plates, pale stain to lower margins of last 2 plates, neat old ink inscription to blank side of title page, plate at page 266 misplaced at page 255, otherwise a very good copy. No copies of this dated edition in the major UK libraries, no copies listed in Lowendahl, Sino-Western Relations ...in Western Printed Books 1477-1877. 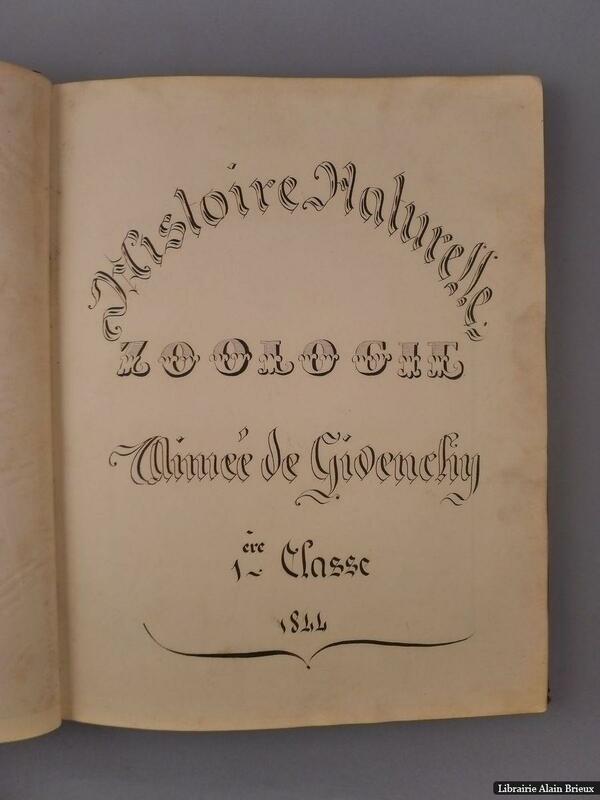 1 dated copy listed in World Catalogue, undated edition listed in Henri Cordier, Bibliotheca Sinica. MORE IMAGES ATTACHED TO THIS LISTING, ALL ZOOMABLE. FURTHER IMAGES ON REQUEST. POSTAGE AT COST. NÜRNBERG., Blick in die Karolinenstraße mit schönen alten Häusern (meist mit Erkern und Gauben), im Hintergrund die Lorenzkirche. NÜRNBERG. Blick in die Karolinenstraße mit schönen alten Häusern (meist mit Erkern und Gauben), im Hintergrund die Lorenzkirche. - Kolorierte Lithographie mit Tonplatte von Ciceri u. Bayot nach Chapuy, 1844, 39 x 27 cm. Lentner 9282. - Ein besonders reizvolles Nürnberg-Blatt auf Grund der reichen Staffage mit Händlern, Pferdefuhrwerk, Traggaul mit Lasten u.v.m. - In feinem Kolorit und sehr gut erhalten. Leipzig: Breitkopf & Härtel [PN 7069], 1844. 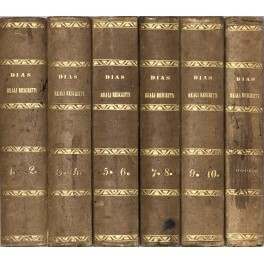 First Edition, variant issue, distinguished by differently typeset text. Hofmann p. 115. McCorkle pp. 223-24. Hoboken 15, 93 (with original wrappers). The full score of the work was not published until 1845. The author of the inscription is unknown; the use of the word "Tandler" suggests that he is from either Austria or Bavaria. 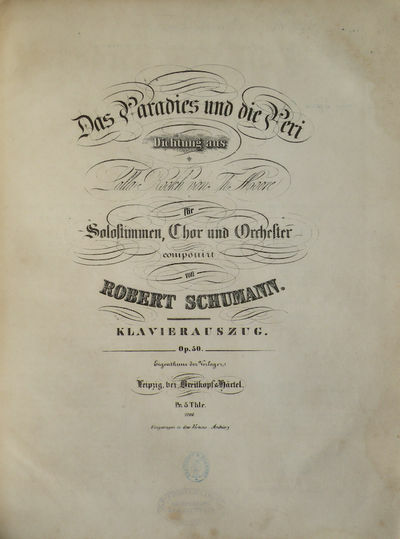 The text of the oratorio was translated from the English original by Emil Flechsig (1808-1878); Schumann made significant alterations.. Folio. Quarter mid-brown cloth with paper boards with octagonal paper label titled in manuscript to upper. 1f. (title), -4 (text), 3-133, [i] (blank) pp. Title lithographed, text typeset, music engraved. Handstamp "T. J. Roothaan & Co Muzijkhandel en biblioteek Amsterdam" to foot of title. With rhymed inscription in black ink to head of verso of title: "Der Tandler hatte kein Interessanteres / Drum schick ich dieses und kein Anderes! Haag, im April 1932." Binding quite worn; spine frayed and partially lacking; last line of manuscript text to label crudely erased. Minor staining and foxing, most noticeable to first leaves. With pencil markings to alto staves in part 3 (pp. 77-83). Dizionario storico di educazione in cui son poste in esercizio tutte le facoltà dell'anima. Surrogando a precetti ed alle sentenze gli esempi, a ragionamenti i fatti, in ultimo alla teoria la pratica. Con un quadro alfabetico cronologico de' personaggi più ampio ed importante che nelle precedenti edizioni. Prima versione italiana arricchita di nuove aggiunte e adorna di litografie desunte da celebri autori e dipinti a guisa di Classica Antologia e Museo Pittorico. Gattei, 1844. 2 voll., in 8°, m. pelle, pp. 716 + 880. Front. del 2° vol. con restauro sommario nella parte inferiore che copre parte dei dati bibliografici. Molto buona e estramamente rara. I due volumi sono arricchiti da 38 litografie di cui 25 a colori. La prima litografia del 2° vol. presenta un restauro sommario che non interessa l'inc. stessa, inoltre nel medesimo vol. risulta mancante una litografia (La morte di Eudossia). Die deutschen Eisenbahnen, in Beziehung auf Geschichte, Technik und Betrieb. PEGNITZTAL. - Mayer, Friedrich. Wanderungen durch das Pegnitzthal. Poe, Edgar Allen, Willis, N. P.
Riker, 1844 First appearance of Poe's "Morning on the Wissahiccon," also called "The Elk," which describes the beauty of a creek in Pennsylvania. Good in original covers. Water damage to pages. 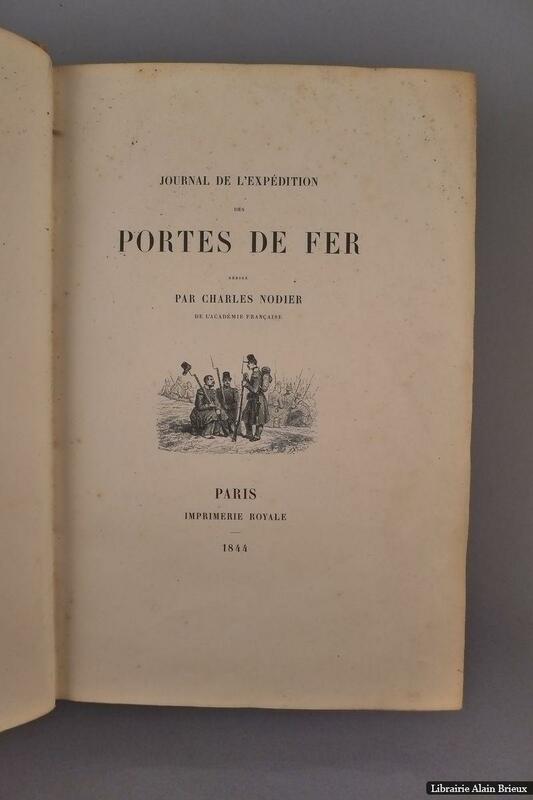 1844 on the title page.. 1st Edition. Hardcover. Good. London: David Bogue, [ca. 1844]. 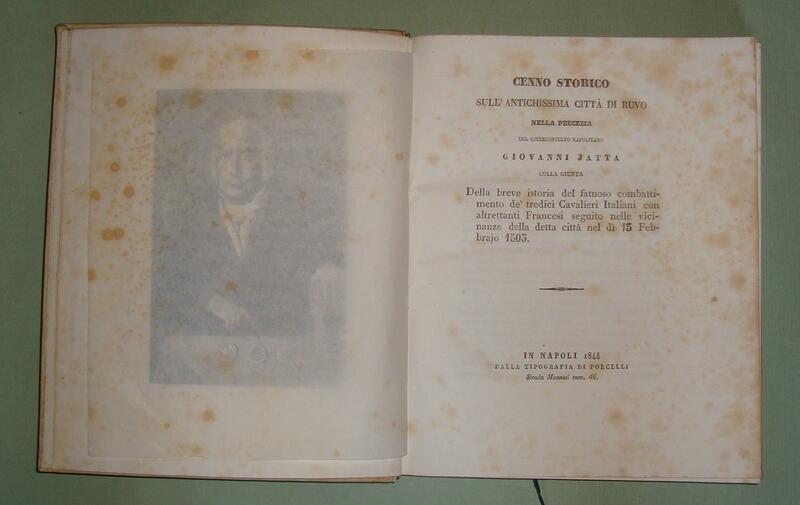 Large octavo. 19th century quarter dark blue morocco with matching cloth boards with single gilt rule to edges, raised bands on spine in decorative compartments gilt, titling gilt. 1f. (half-title), 1f. (recto blank, verso full-page hand-coloured engraving of Carlotta Grisi in La Giselle by A.E. Chalon after H. Robinson within decorative border, 1f. (recto title, verso blank), 1f. (recto dedication, verso blank), 1f. (recto contents, verso list of plates), [ix]-xiv, 1f., 160 pp. With bookplate of William L. Scott to front pastedown. 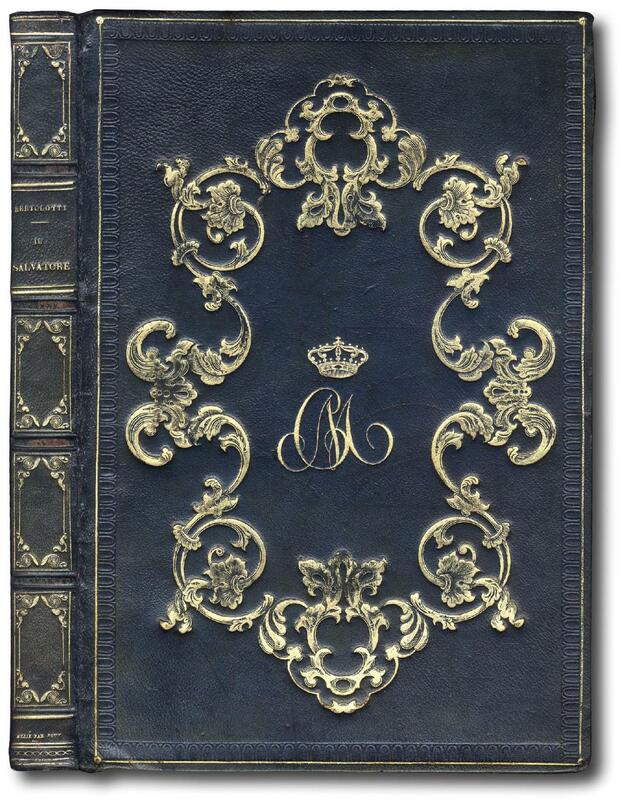 Includes 10 full-page hand-coloured engraved plates of famous dancers and singers including Carlotta Grisi, Persiani, Giulietta Grisi, Fanny Elssler, Cerito, Taglioni, Sontag, Falcon, Dorus-Gras and Treillet-Nathan from productions including Giselle, The Barber of Seville, Norma, Le Diable Boiteaux, Ondine or the Naiad, La Sylphide, Don Juan, The Jewess and The Huguenots. With fine hand-coloured wood engravings throughout text and many leaves with elaborate borders printed in colour. Binding slightly worn. A very good copy overall. Derra de Moroda 1272. Niles & Leslie I p. 225. A fine example of decorative Victorian book production and an important contribution to music and dance iconography of the period. Torino, Eredi Botta, 1844. in-4 (294x205mm), pp. 367, (1 bianca), tavola in antiporta e frontespizio entro cornice architettonica in rosso, blu e oro. Splendida legatura coeva in piena pelle verde, titolo in oro su dorso a quattro nervi lavorato in oro a piccoli ferri, dorsi ornati da filetti in oro, cornice a secco e bella bordura romantica che incornicia le armi di Maria Cristina di Savoia al piatto posteriore eil monogramma MC sormontato da corona al piatto anteriore. Tagli dorati. Edizione originale, rara, alle armi di Maria Cristina.. Parenti, IV/238-9..
Southampton. 1844 - Size: 655 x 1000 mm. Fine condition. Electrotype engraving with original full wash colour. A truly superb, accurate and informative ordnance survey map of the county of Essex, together with the extreme northern coast of Kent and a small portion of north and east London. The map is neatly dissected into 24 linen backed squares, and conveys an extraordinary amount of depth and detail to the regions that it covers. Parks, Stately homes, roads, rivers, lakes, railways, copses, forests and woodland are all rendered in the finest detail. 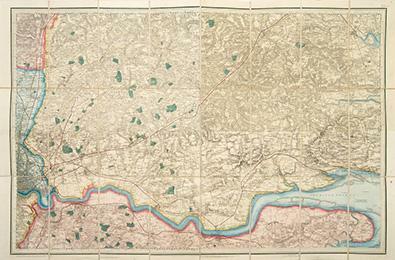 This map is the North East section of an original 4 sheet map, entitled "Forty Miles around London". The extent of the map is from Dartford in the south to Tottenham in the west to Rochford in the east to Fyfield in the north. London: J. Arrowsmith, 1844. Map. Engraving with original hand-coloring. Image measures 20.5 x 29". This elegant map of Central Asia centers on modern-day Iran and includes portions of Iraq, Turkmenistan, Afghanistan, and Pakistan. 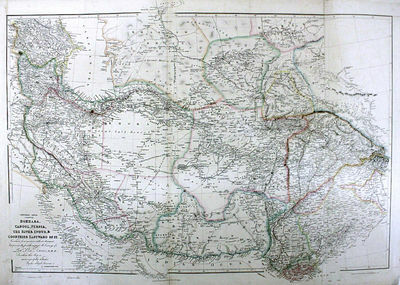 As an annotation below the title states, the map was based on surveys by Alexander Burnes, a Scottish explorer, whose 1834 narrative of his travels through the region was one of the most popular books in Britain in the period. Arrowsmith's map reflects the great increase of knowledge Burnes's travels produced. It is extremely detailed and labeled with cities, political boundaries, rivers, and roads. Annotations about land and native people are scattered throughout, and Arrowsmith's journey is marked in red. Some regions extend beyond the borders of the map, which extends onto an additional third fold-out section affixed to the right side. The map is from Arrowsmith's "London Atlas of Universal Geography." It is in very good condition with few chips and tears and minor soiling. John Arrowsmith (1790-1873) was from a family of London based cartographers and publishers, and was a founding member of the Royal Geographical Society. His "London Atlas," known for its understated elegance, is considered one of the first truly "modern" atlases of the nineteenth century. This map is a fine example of Arrowsmith's work. In the original publishers brown embossed cloth, corners bumped. 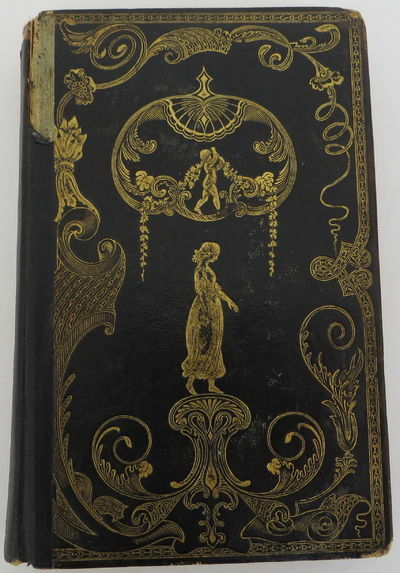 Re-laid spine, gilt titles, frontis, , (vi-viii), , , , 2-150 pp, (8) adverts, 5 pls (portraits), 13 illustrations within text, yellow endpapers, ink numbers at spine base, library stamp to fpd & verso of frontis, hinges strenghtened, new rear endpaper, small label to verso frontis. Only 500 copies printed. A portrait of a leading geologist whose work on the understanding of strata was an important contribution to the field. In 1831, the new generation of Fellows of the Geological Society, long aware of the treatment meted out to Smith, awarded him their first Wollaston medal in "recognition of his being a great and original discoverer in English Geology" (Proceedings of the Geological Society, 1, 1831, 271). In 1832 he received a government pension of £100 a year.